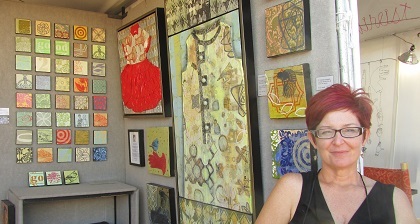 It was a beautiful day for an art fair, clear blue skies with white puffy clouds over the San Francisco Bay. 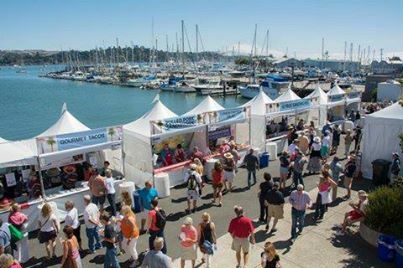 TWE makes it a point to stop by Sausalito this time of year to see what their annual art festival has in store. An eclectic variety of everything you could call art was visible–from giant sculptures of bronze dogs and female figures to glorious splashes of color on canvas and metal in the shape of high heels. But what was particularly EYE-catching were the fascinating hats and “dress paintings” created from vintage clothing. And you know how TWE loves hats and unique fashion! Lines were gathering at the Jax Hatz booth even though you would hardly think you’d find such finery here amongst the oils and acrylics. 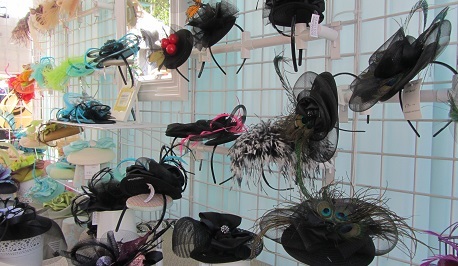 A multitude of stylish hats were on display and leaving with their new owners. 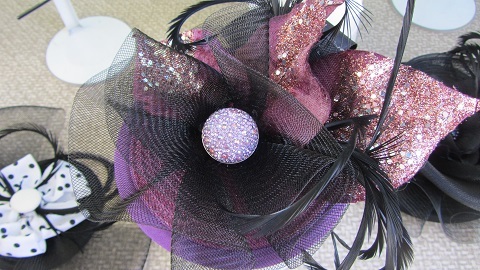 But the ones that stole the show were the fascinators. These “wearable art” creations with their fancy toppings were the topic of conversation. 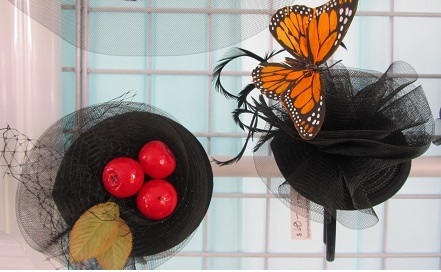 We think of them as chapeaux for British royals but women were ready to perch them on their heads with great gusto today. “Jax” is a fifth generation San Franciscan and, as a child, went on shopping trips with her grandmother to buy Easter outfits matched with, of course, the perfect bonnet. 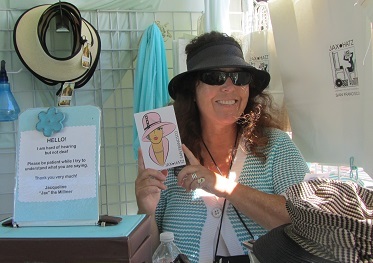 At 12, she designed her first JAX o HATZ and she’s been hatting ever since. She claims all of the hats she’s created would reach the entire span of the Golden Gate Bridge and that with each comes its own fascinating story. Two that TWE particularly admired are adorned with butterfly and apples. 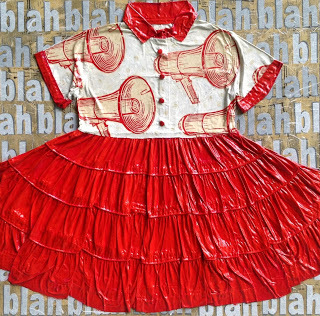 We call this flair with a capital F.
In the 1990’s this mixed media artist wanted to know if she could attach a dress to a canvas and create a painting to which oils could be added over the textures. This art of “dress painting” evolved. She now combines new elements such as photographs and embroidery to her creations. 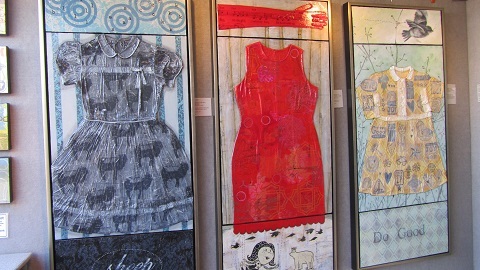 The dresses we saw were displayed on canvas with the addition of linoleum block prints and acrylic paint. Here is a selection of her special talent. Thanks to “Jax” and Katrine for sharing their ingenious creations. It’s time to head to our closets to see what we might turn into a wonderful piece of art to wear or not to wear. That is the question!